Each passenger is allowed to take only one piece of hand luggage. The maximum weight allowed for each hand luggage may vary according to the airline’s luggage policy. As specifically provided for by the ENAC, the sum of the different dimensions of the piece of luggage must not exceed 115 cm. We also inform you that it is no longer possible to take on board items that were formerly tolerated (for further information, please click on the Airlines‘ web sites or visit ENAC web site). To protect you against the new threat of liquid explosives, the European Union (EU) has adopted new security rules that restrict the amount of liquids that you can take through security checkpoints. They apply to all passengers departing from airports in the EU whatever their destination. This means that, at security checkpoints, you and your hand luggage must be checked for liquids in addition to other prohibited articles. However, the new rules do not limit the liquids that you can buy at shops located beyond the point where you show your boarding pass or on board an aircraft operated by an EU airline. The new rules apply from Monday, 6 November 2006 at all airports in the EU and in Norway, Iceland and Switzerland until further notice. You are only allowed to take small quantities of liquids in your hand luggage. These liquids must be in individual containers with a maximum capacity of 100 millilitres each. 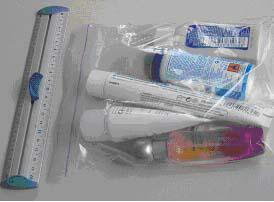 You must pack these containers in one transparent, re-sealable plastic bag of not more than one litre capacity per passenger (see photo below). remove laptop computers and other large electrical devices from your hand luggage. They will be screened separately whilst you are screened. If you have any doubts, please ask your airline or travel agent in advance of travel. Please cooperate with airport security and airline staff. This information has been developed by European Commission, the Association of European Airlines and Airports Council International Europe. Disclaimer: This document summarises for your information the main elements of the relevant EU legislation; it is not the actual legal text.